by Greg Robins, C.P.T., and Jamie Smith, C.S.C.S. Ask any basketball player what they want to improve and often you will hear “my vertical.” To improve your vertical jump, you must be able to apply more force into the ground in a shorter amount of time. Doing that increases your power output (Power = Force x Velocity). Many people think that your overall strength makes you jump higher, but you can only get serious “ups” after you build up your strength and you learn to use that force quickly. Additionally, an athlete has a better chance of tapping into his potential force production quickly when he can demonstrate efficiency of movement. 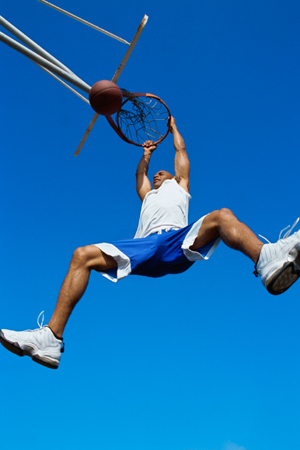 The tips and workout below will send you on your way to high flying success on the court. Give it a try! Maximal strength isn’t the only thing you need for better vertical, but it helps. If Athlete A can use a high percentage of his strength quickly but can only squat 135 lbs., he isn’t going to out-jump Athlete B, who can access less strength in a given time, but can squat 315 lbs. Follow a sound program that develops your strength in basic lifts such as the squat and deadlift. The second part of the power output equation is velocity. You may be able to squats hundreds of pounds, but the movement may take anywhere from 0.4 to 0.7 seconds (the average time to develop peak force). Meanwhile, the vertical jump test takes about 0.2 seconds to complete. In order to develop the ability to apply force quickly, you have to efficiently absorb force via proper landing. A great way to improve your ability to call upon force quickly is to utilize various landing and jumping training. Stance: 1. Start with the feet hip-width 2. Hips slightly back (hip hinge) and back is arched 3. Knees slightly bent and rotated outward 4. Place the stick behind the lower back with elbows behind and forearms under stick 5. Palms up. Take off: 1. The movement will begin from a static athletic position (no counter-movement) 2. Perform the jump by getting triple extension from the ankle, knee, and hip 3. Keep the palms up and stick tight to lower back. Stance: 1. Start with the feet hip width 2. Hips slightly back (hip hinge) and back is arched 3. Knee’s slightly bent and rotated outward 4. The barbell will be positioned like a traditional squat. Greg Robins, C.P.T., and Jamie Smith C.S.C.S. are trainers with Total Performance Sports in Everett, MA.